which will Premiere this year at the Pearl Harbor Visitor Center on Dec. 4th. It’s part of the official Remembrance Day programming. 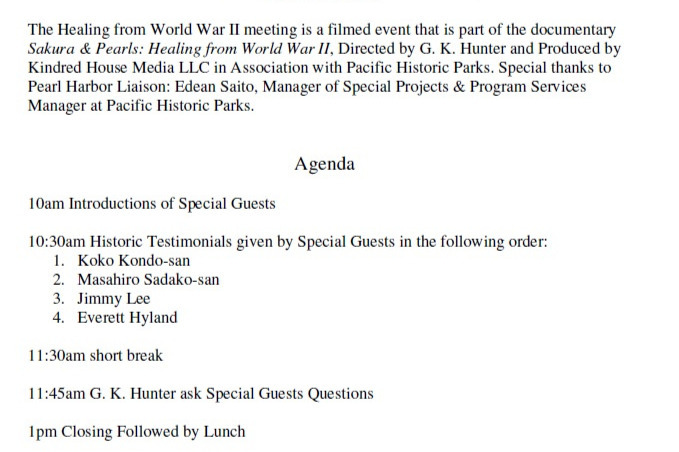 I need your help to make a historic meeting happen on Sunday April 28th, where we will be flying out 2 Japanese Atomic Survivors from Japan to Pearl Harbor to have the final meeting with 2 Pearl Harbor Attack Survivors. UPDATE as of 4/18/19: We've raised our first $1000 and also received a donation of airline miles to cover the flight of one of our Japanese survivors. We are working on securing the airfare and hotel of another survivor. Please spread the word. Here is the agenda for the special meeting in 10 Days! Beginning with this historic meeting between nations, “Sakura & Pearls” is a documentary that tracks the generational aftermath of both Japanese atomic bomb survivors and American survivors of the attack on Pearl Harbor. The stories of these survivors, as well as their children and grandchildren, still strike a deep emotional cord in people from both nations. As they recount their experiences, the seminal questions arise around the generational impact from World War II. What wisdom do these survivors have to share with the future generations? What guidance to they have for navigating the modern world where international tensions are escalating? The emotions expressed during the 2016 memorial services held in Hiroshima and Pearl Harbor show us that the healing process is still happening in bot Japan and the United States. The survivors of these events revealed the emotions that they've been holding inside for 75 years. This inspired me to arrange for an intentional meeting between survivors from both nations. What further healing could happen? 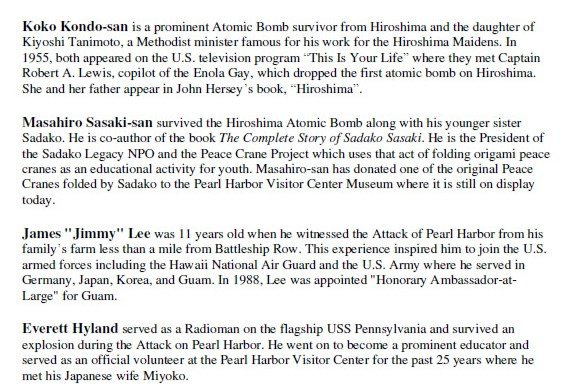 Sakura & Pearls goes beyond previous World War II documentaries by hosting a meeting between the U.S. survivors of the Pearl Harbor Attack and the Japanese survivors of Atomic Bomb. 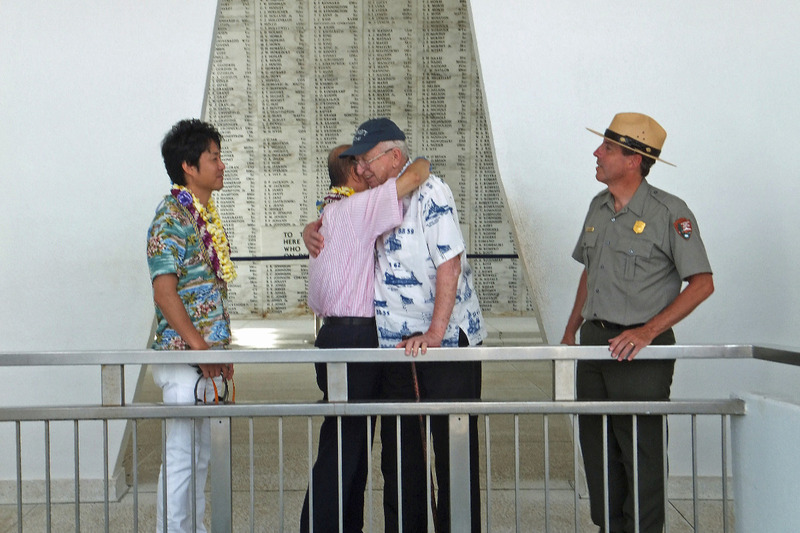 This meeting will happen on April 28th, at the Pearl Harbor Visitor Center. What will happen when they meet? Why are their stories still relevant today? I live on Oahu just 15 minutes north of Pearl Harbor. 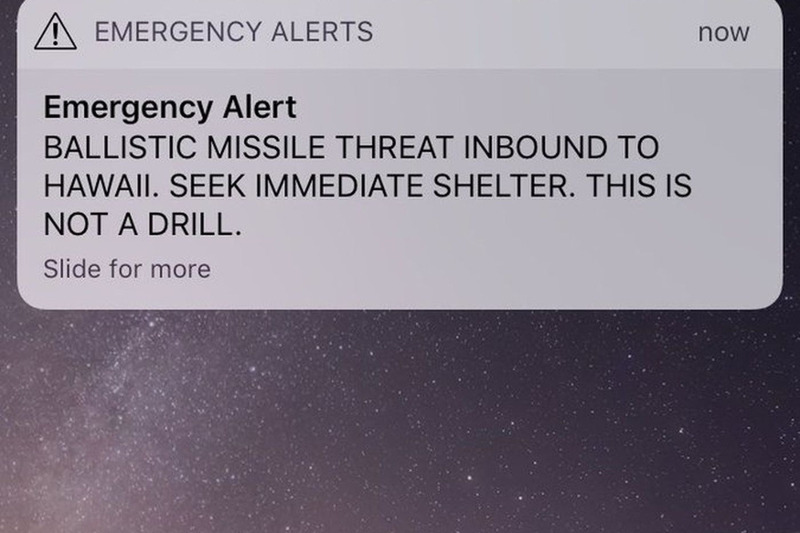 Last year, in January, everyone in the Hawaiian Islands received an emergency text message that stated: “Ballistic Missile Threat Inbound to Hawaii. Seek Immediate Shelter. This Is Not A Drill.” Fortunately, this was a misfire of the emergency alert system, however, it stirred up fears going back to the Pearl Harbor attack which is still commemorated each year on the Dec. 7th. As international tensions escalate, we need to hear from the people who’ve endured some of the most devastating war attacks in history. Koko Kondo-san survived the Atomic Bomb when she was only 8 months old. Her house collapsed on her while she was still in her mother’s arms. 10 years later, she appeared on the American TV Show, “This is Your Life”. There, she met Capt. Lewis, who was the co-pilot of the Enola Gay that dropped the atomic bomb on Hiroshima. Everett Hyland earned the Purple Heart for surviving an explosion on the USS Pennsylvania during the Attack on Pearl Harbor. I recently attended his 96th birthday celebration at the Pearl Harbor Visitor Center recently where I met his Japanese wife, Miyoko, for the first time. Jimmy Lee who is Japanese American man from Oahu who witnessed the attack of the Japanese zeros from his nearby family’s farm. What will happen when these 4 people meet for the first time? You’ll have to see the documentary to find out. But you can make help make this special meeting happen! We can wait any longer to film this meeting. When I tell people about my movie, they always ask “Aren’t the survivors in the 90’s?” Yes, many of them are in their 80’s and 90’s. That’s why I’ve been scrambling to capture their stories for the past 2 years. We need to capture their stories before they are no longer here. That’s why I urgently need your help. This project will inspire generations to come. Help me make this movie in time for its historic premiere on Dec. 4th, 2019 at the Pearl Harbor Visitor Center. Please spread the word!